With the rise in cosmetic enhancement procedures like Botox injections, laser skin resurfacing and injectable fillers, it can be near impossible to guess someone’s age these days. So the next time you find yourself a little curious, you’ll have to look beyond traditional signs of aging. 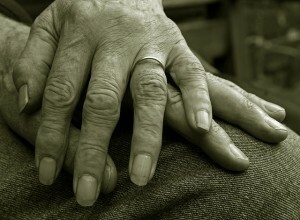 Age (liver) spots – When most people think about sun damage, they don’t even consider their hands. For this reason, the hands are particularly vulnerable to discoloration and sunspots. Wrinkly skin – Wrinkles are a tell-tale sign of aging. Because the hands are usually drier than many other parts of the body (due to hand washing throughout the day), they’re more prone to wrinkles. Translucent skin – The skin on our hands is actually thinner than the skin on our faces. Over time, as our hands naturally lose volume, causing our skin to look paper thin. Lost volume – Like the face, decreased collagen production beneath the surface of the skin can cause our hands to lose volume as we age – eventually appearing sunken or hollow. Noticeable veins – The veins, tendons and bones on our hands become much more prominent as we age and our skin begins to lose some of its elasticity (tightness). Though the hands seem to be more of a tell-tale sign of age these days, many of the same procedures used for the face can be used for the hands as well. Retinoids, microdermabrasion and chemical peels are great for treating sun damage, while dermal fillers and laser skin resurfacing can add volume to the hands and minimize the appearance of wrinkles. So really, it may be near impossible to guess someone’s actual age these days.